It’s no secret the Ducks are loaded in the backfield this year. With three proven every-down backs, and a slew of young talent waiting for a chance to shine, Oregon is in as good a position as any team in the nation. A favorable schedule, and a competent quarterback to keep teams from stuffing the box could mean Oregon will have two 1,000-yard rushers this year. It would be the first time since 2008, when Jeremiah Johnson and LeGarrette Blount barely completed the feat. If you can remember, Blount hurdled, and barreled his way through Oklahoma State’s secondary to put away the Holiday Bowl, gaining 1,002 yards on the season. 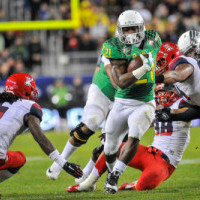 Royce Freeman hits a hole In the Pac-12 Championship game. 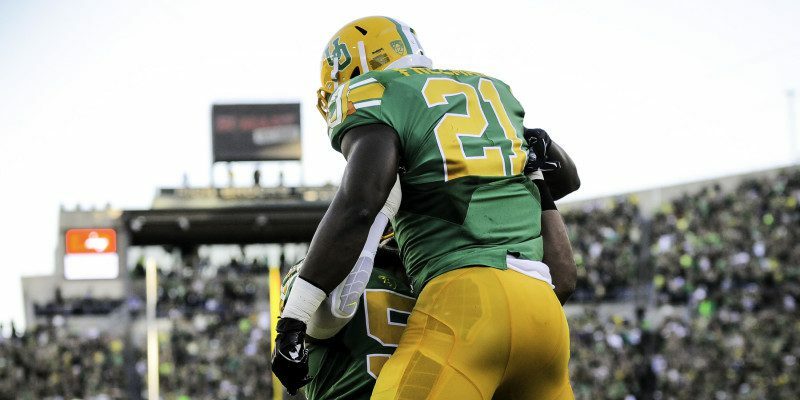 Oregon’s two featured backs in 2015 will be Sophomore Royce Freeman and Junior Thomas Tyner. Both are physical runners, with Freeman, offering a more thunderous style to Tyner’s lightning. Last year Freeman gained 1,365 yards on 5.4 ypc with Tyner gaining 573 yards on 5.1 ypc. Tyner missed four games due to injury and played hurt in two games severely limiting his production. He arguably had his best two games in the Rose Bowl and National Championship games where he gained 124 yards on 13 carries and two touchdowns, and 62 yards on 12 carries respectively. Tyner’s stats in the National Championship game do not seem too impressive, but if you watch his film, he was making all the right cuts, and running with authority. If both Freeman and Tyner stay healthy it will be interesting to watch them play, especially after another year in the weight room and a more complete understanding of the system. I don’t think either will be preferred over the other, but look for Byron Marshall and redshirt sophomore Kani Benoit to steal some snaps while the games are still in doubt. Marshall is already a proven 1,000 yard rusher, and will be used to confuse defenses by lining up at receiver and running back in certain personnel packages. Benoit is fairly untested, but he possesses great vision and at 6 feet tall is a big back with good footwork. He ran for 40 yards on four carries against Florida State’s demoralized defense near the end of the Rose Bowl. Kani Benoit runs through an Arizona defender in the Pac-12 Championship game. I expect Week 1 against Eastern Washington to be a rout. I don’t think it will be a huge game for either back as they will be pulled from the lineup early to give some snaps to younger guys such as Benoit and Tony Brooks-James, the speedy redshirt freshman from Florida. After Week 1 the offense will be primed to rely heavily on the running game. With inexperienced quarterback play, fans should expect a lot of bubble screens to widen defenses and runs up the middle to penetrate them. I don’t see that changing a lot until maybe October. And even then, if the quarterback will be Eastern Washington transfer Vernon Adams, expect Oregon to use Adam’s athletic ability and run a lot of read-option plays, where the backs could still get the handoff. With scheme and personnel helping to propel a heavy load for Oregon running backs, an extra game can’t hurt either. If Oregon shares the same success it did last year and makes it to the National Championship game, it will have an extra game on the schedule. Oregon has played in two National Championship games in the past five seasons, and the road to get there again has been made easier for Pac-12 teams, usually disqualified with a 1-loss regular season. Thomas Tyner runs through two Florida State defenders in the Rose Bowl. The Ducks have the talent to make another run at a national championship and the running backs to carry the load all the way there. If Freeman, and especially Tyner, can make it through the season without major injury, there’s no reason why both can’t run for at least 1,000 yards in 2015.